On Dec. 30, a robotic surgical procedure took place for the first time at Northeast Georgia Medical Center, fulfilling a longtime dream for local doctors. At the hospital’s Lanier Park campus, Gainesville surgeon Dr. Alex Nguyen performed a gastric bypass, a common procedure that helps morbidly obese patients lose weight by drastically reducing the size of the stomach. He has done this operation many times before. But on this occasion, Nguyen’s hands didn’t touch the patient. Instead, he sat at a console and manipulated controls similar to those of a video game. The "joysticks" allowed him to maneuver four mechanical arms that inserted instruments into the patient’s abdomen via small incisions. One of the arms included a 3-D camera, and Nguyen watched on a large, high-definition TV screen as the instruments moved inside the patient’s body. This equipment is known as the da Vinci Surgical System. Nguyen was trained on the machine while serving a surgical fellowship at the University of Texas. But he is the first doctor to use the device at Northeast Georgia Medical Center. An anonymous $1 million donation last February to the Medical Center Foundation enabled the hospital to buy the da Vinci system. 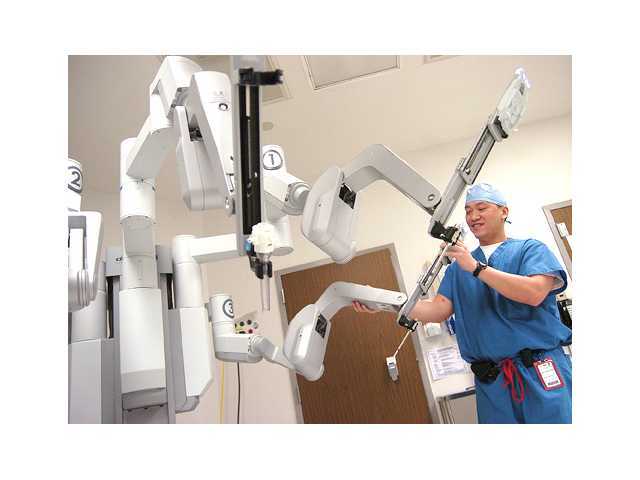 Some surgeons had been asking for robotics ever since the Ronnie Green Heart Center opened six years ago, but there wasn’t money in the budget. Now that the da Vinci has been acquired, hospital officials plan to put it in one of the 23 spacious operating rooms of the new North Patient Tower, scheduled to open this spring. But in the interim, they decided to set it up at Lanier Park so that surgeons could practice with the equipment. Jolinda Martin, vice president of patient care services for the medical center, said they’re thrilled the da Vinci is finally here. "Our staff is very excited about having an opportunity to work with this," she said. "There’s been a lot of publicity about robotics over the past couple of years, and we think it will help us to attract talented physicians to our community." Why all the fuss about robotics? Martin said the da Vinci allows greater dexterity and makes it possible for the surgeon to work within tighter spaces than the human hand can reach. It’s especially useful for cardiac surgeons, who use it for valve surgeries, and urologists, who can more easily remove a prostate without damaging any nerves. For bariatric surgeries such as gastric bypass, Nguyen said the robot is his preferred method. "It makes the surgery tremendously easier," he said. "In delicate movements such as sewing, it eliminates any hand tremor. And the da Vinci provides two lenses in one camera, so you have two views." 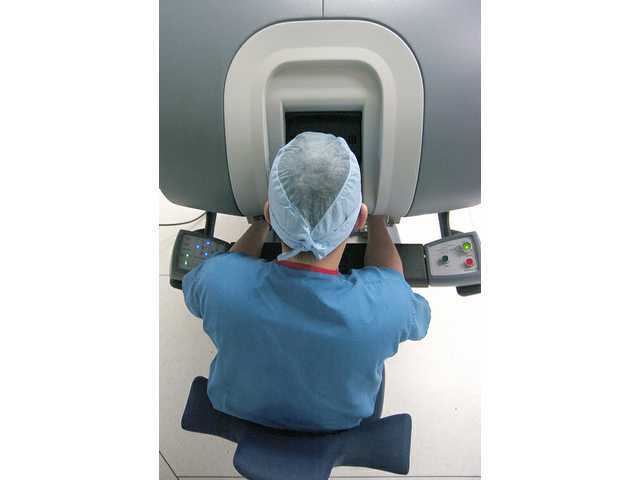 Nguyen had to go through a detailed training protocol in order to be certified to use the da Vinci, which is manufactured by Intuitive Surgical. Now a number of other surgeons in Gainesville are completing the process, including traveling to one of five sites in the U.S. where they can learn to use the console by operating on animals. Though robotic surgery is not appropriate for every patient or every procedure, Martin thinks the da Vinci represents the wave of the future. "We anticipate that it will be used every day (once the Tower opens)," she said. The robot won’t be used for cardiac procedures until then, because Lanier Park’s operating suites aren’t large enough to accommodate the extra equipment and staff that heart surgery requires. But it seemed fitting that gastric bypass would be the first robotic surgery performed, because Lanier Park already is ranked as a Center of Excellence for bariatric surgery. And Nguyen believes he found the ideal pioneering patient in South Hall resident Linda Giles. "She was an excellent candidate and really needed the bypass," he said. Linda Giles, 35, is disabled and lives with her parents. Her type 1 diabetes makes her dependent on insulin, and other health problems prevent her from getting much exercise. Her weight had climbed to 212 pounds, causing sleep apnea, gastric reflux and high blood pressure. Janice Giles, Linda’s mother, said the family was surprised and pleased that Linda was chosen as the first person in Northeast Georgia to have robotic surgery. "We’re real proud that she was the first one," Janice Giles said. "It went great, and she had no complications. She’s already lost about 15 pounds since leaving the hospital, and she’s taking a lot less insulin now." Giles said she hadn’t ever heard of robotic surgery until Nguyen told the family about the technique. "It’s amazing to me," she said. Nguyen said the da Vinci was an important factor in his decision to come to Gainesville about five months ago. "I was offered an awesome teaching position at the University of Texas," he said. "But my wife (who now works as a physician in Cleveland) really wanted to be here. So I started looking for jobs in the Atlanta area. "Then I found out that Northeast Georgia Medical Center was getting the robot, and it seems like this was where I needed to be."